publish in Images on December 22nd, 2008 by tiki god | Report This Post | Click to Add to favorites | Tags: Humor, Science! That static machine looks familiar. Mom just told her dad’s pecker was bigger? This makes no sense! I demand clarification! The machine looks like a dong. @Sfreak: Yes it does… HAR HAR.. (flappycunt -out). That right there is a genuine awesomeface. 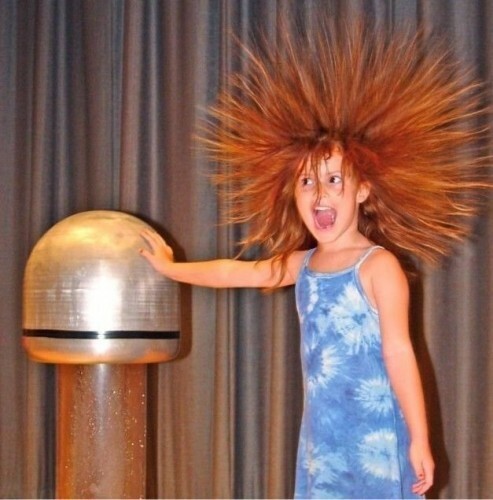 Cool, a Van de Graaff generator. you beat me kocollins. however, i did not need to look it up on wikipedia. Van de Graaffs are not cool. Knowing about them does not make you cool. I know this, because I know about them and I am uncool.